Prepare to go on a fun journey with these under the sea birthday party ideas. Remember to take lots of pictures! Write your under the sea birthday party invitations on sheets of paper with a silver marker. Next, laminate the invitations, and ensure they are waterproof. The wording of your under the sea birthday party invitations can say “Calling all Jellyfish, Sharks, Squid and Seals, too…There’s going to be an adventure, and we’d love to share it with you! You’re O-Fish-ally invited to come under the sea. It’s (your child’s name) Under the Sea Birthday Party!”. Then include day, time, address. Here is a slightly different idea for your under the sea party invitations. Make your under the sea birthday party invitations as “messages-in-bottles.” Simply fill clear plastic bottles with sand, mini sea shells, glitter, etc. Write your invitations on parchment paper, then roll them into scrolls, and insert invitations into bottles. To welcome your guests, hang balloons and streamers on your mailbox and front door. Put sea life posters on the fence, and hang plastic tropical fish from the tree branches. Fill kiddie pools with water, and place them in the yard. Decorate your under the sea birthday party room with green and blue balloons. Hang green “seaweed” streamers from the ceiling, chairs, or from the top of a windowsill. Cut out starfish, seahorses, and other sea animals from construction paper. Tape cutouts to some of the streamers. Cover the lights in the room with blue cellophane paper, which will give the party “under water” feeling. Spread out any stuffed sea animals that you might have around the room. Have Mylar fish and dolphin balloons free-floating in the area, and have lots of blue latex balloons on the floor to create “ocean atmosphere.” Hang a fish net in the corner of the under the sea birthday party room. Put a blue or turquoise tablecloth on your under the sea party table, and then spread multi-colored confetti around it. Put plastic fish in a clear bowl for table centerpiece. Hang a personalized theme “Happy Birthday!” banner in the area. *Seascape Gel Bags: Here are some directions for your under the sea birthday party guests to follow for this activity. Cut small fish from foam paper. Fill a Ziploc bag with blue hair gel so when the bag is closed it’s about 1/4″ thick. Place the fish shapes, colored beads, and some glitter in the bag. Squeeze out excess air from the bag before sealing it. Place the bag, sealed end first, inside another bag. Seal the second bag and cover the zipped end with clear tape. Have children make the fish move by running their hands over the surface of the bag. *Sea Turtle Activity: You can purchase Sea Turtle Activity kit from a party store. Get the kids to decorate their own sea turtles with colorful paints. *Sea Life Mural: Tape a wide sheet of butcher paper on the wall at kids’ eye level. Spread posters and pictures of tropical fish, dolphins, sharks, and other sea animals for ideas. Provide the kids with paints and markers, and let them create a mural of sea life. Since kids are fascinated with sea life, any theme related items as keepsakes will do the trick! For your under the sea party favors, you can have such items as beach balls, fish squirts, straws, sticker sheets, toy dolphins, and starfishes. *Pin-the-Tail on the Whale: This classic game is easy to design and set up. Just draw a large whale on paper, leaving out the tail. Then cut out “whale tails” for all your guests. Put children’s initials and a double-sided tape on each tail. At game time, blindfold the kids one by one, spin them around, and get them to pin their tail shapes where they belong. *Shark Chase: Get the kids to spread out on one side of the party area – they are fish. Scatter five or more hula hoops around the opposite side of the area (the hoops are the fish’s “homes”). Select one child to be a shark, and have that player stand between the “fish” and their “homes.” When the “shark” calls Shark!, he or she runs after the “fish” and tags as many as possible. The fish must reach home – step inside the hula hoop – to be safe from the shark. Any player who is tagged becomes a shark for the next round, and tags remaining fish. For each round, take away one hula hoop until only one hoop is left. The game continues until all the fish are caught. Have the kids take turns throwing beanbags into a pail. Allow children to choose a prize from whatever bucket the beanbag lands in. Be sure every under the sea birthday party guest receives a prize. *Octopus Alert: Here is a great outdoor game for under the sea birthday party, and it will require water balloons. Choose one person to be an octopus. Arrange everyone else in a big circle around the octopus. Have the kids in the circle toss a water balloon back and forth, trying to keep it away from the octopus. If the octopus pops the water balloon by batting it out of the circle, the person who threw it is out. Last child left in the circle wins. *Musical Sea Animal: Have your party guests sit in a circle. Play lively music in the background, and let the kids pass around a sea animal toy. Whenever the music stops the person holding the toy – goes out of the game, and receives a prize (e.g., favor bag). Play until everyone has won a prize. *Creature Magnets: Draw various sea creatures (e.g., seahorses, tropical fish, octopuses, etc.) on crafting foam, and cut out creature shapes. At game time, have the kids glue craft eyes onto the creature’s head. Next, get them to draw a mouth with a marker. They can decorate the creature with sequins, beads, rickrack, and other craft materials. Lastly, have them attach a strip of magnetic tape to the back of each creature. Kids can take their creations home and put them on the fridge. *Beachcombing Hunt: Fill a kiddie pool with sand. Next, burry some sea shells, rocks, fake jewels and coins in it. At under the sea party, let the kids search for treasures and take them home as keepsakes at the end of the evening. *Fish, Fish, Shark: Turn Duck, Duck, Goose game into under the sea birthday party version. *Magnetic Fishing: Create “fish” by using heavy card stock (make some fish bigger than others). Put them in an empty kiddy pool or painted box. Make “fishing rods” for the kids: use sturdy sticks with yarn “lines” and horseshoe magnet “hooks”. At game time, have the kids catch as many fish as they can using their fishing rods. *Fish Story: Here is an activity where the kids can create their own story. Invite all your under the sea birthday party guests to write a beginning sentence on a slip of paper about sea life. 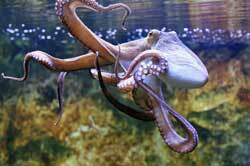 (e.g., “Once upon a time, deep under the water surface an octopus was born.”) Put all the slips of paper into a bowl. Have the kids sit in a circle. Choose one player to pick one slip from a bowl, read it out loud, and then add a sentence related to the original one (but even more exaggerated than the last). The round continues until everyone has had a chance to add a sentence. Then a new slip can be drawn from a bowl. *Fantasy Fish Cake: Bake 13x9x2″ cake. Cut the corners off the cake: the center part becomes the body of the fish, and the cut pieces can be used for tail and fins. Frost the “body” blue, and “fins/tail” – yellow. Add half of the chocolate cream cookie as an eye, and red gummy fish for the mouth. Cut gummy candy rings into thirds. Arrange the pieces over the fish’s body to simulate scales. Take a look at Under the Sea cake and other Fish cake ideas. *Fish & Chips: Lay frozen fish sticks and frozen French fries on separate baking sheets. Prepare them as directed on packages. Tape small paper fish around the outside of a deep serving bowl. Fill the bowl with French fries. Place shredded lettuce (“seaweed”) on a platter, and arrange the fish sticks on top. Serve with catsup. *Goldfish Party Mix: Put 3 cups of Chex cereal, 3 cups of goldfish crackers, 1 cup of pretzel sticks, and 1 cup of peanuts in a large bowl. Pour 1/2 cup of melted margarine over the top and mix well. Place the mixture in a baking dish. Microwave uncovered on high for two minutes. *Sea Shell Surprise: Boil 16-oz sea shell pasta in pot for five minutes. Then drain, and put it in baking dish. Whisk together 2 eggs and 2 cups of milk. Add 2 tbsp melted butter and 2 1/2 cups shredded cheese to egg mixture, then mix well. *Beach Pail Sundae: Serve vanilla pudding, whip cream, and crushed Oreo cookies in beach pails. *“Fish in the Ocean” Drink: Apply colorful fish stickers or confetti to clear plastic cups. Fill with blue powdered drink mix so that when children hold the cups to the light, they will see the fish in a glimmering “ocean”! At party time, prepare blue drink mix according to package directions. Then pour it in a large punch bowl, and add 2 liters of ginger ale. Place several “creature” ice cubes in each of tall clear glasses, and then fill with delicious drink.